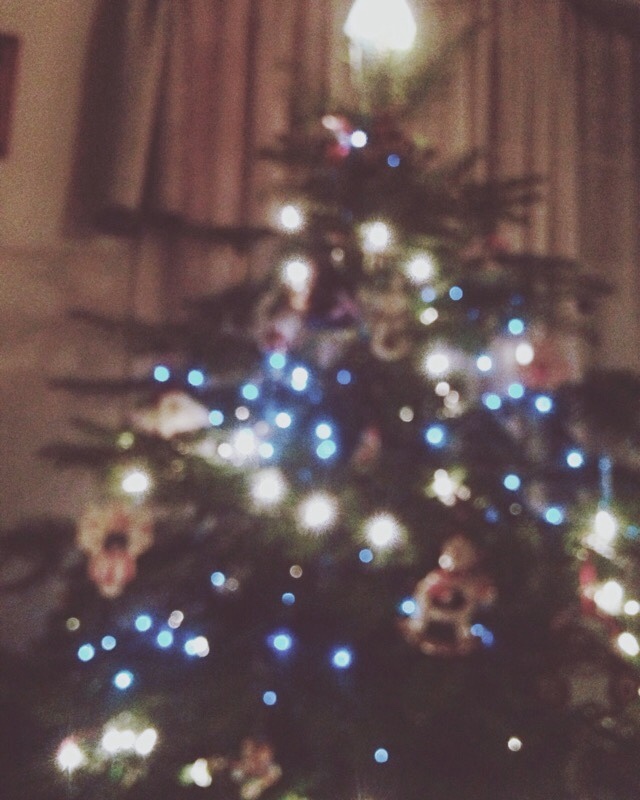 It has been exactly a week since we have had our tree up, and it has completed the Christmastime spirit in our home. This is the second year that we have put up a live tree, and it has been wonderful. 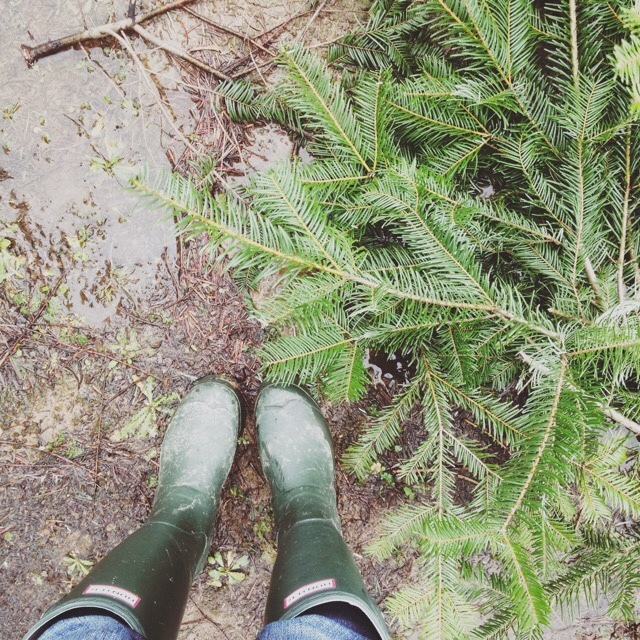 The experience of going to a Christmas tree farm with my family is so much fun, hunting for the perfect Biggs family Christmas tree. The tree farm we went to last year was unfortunately closed for the season, but luckily, we stumbled upon another tree farm in Damascus, Oregon. 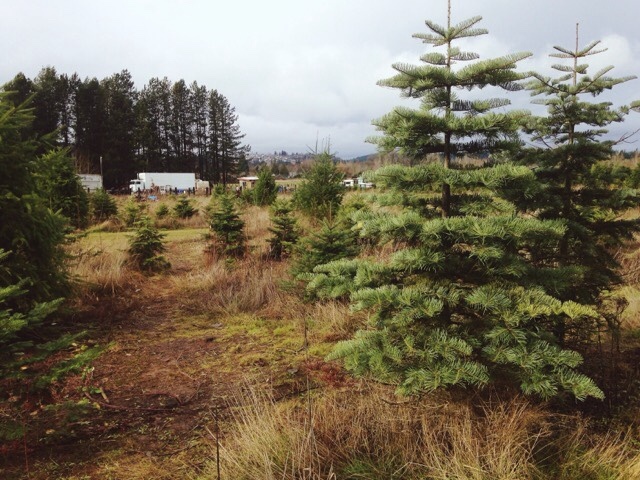 Caleb Lane Tree Farm was hopping with many families searching for their perfect Christmas tree. We were lucky to find a parking spot! 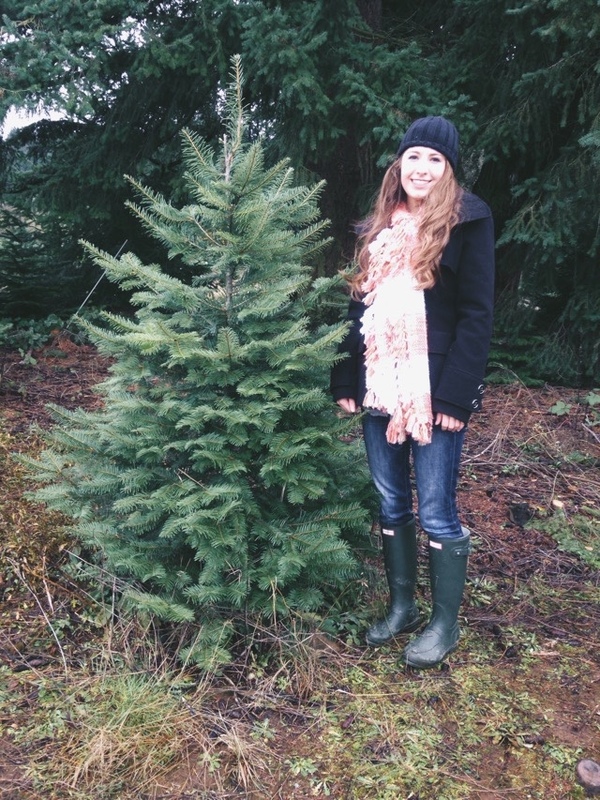 We had four acres to tromp around on, looking for our tree, and we found a few contenders. We found shelfy trees, trees that look as if their branches were Grinch fingers, and trees that could be the one. We had a lot of fun at Caleb Lane Tree Farm, and searching for a tree as a family is something that I will forever cherish. I believe it was my spunky sister that found our tree. It looked so beautiful and full on the property. We try to get trees that are about 6 feet. 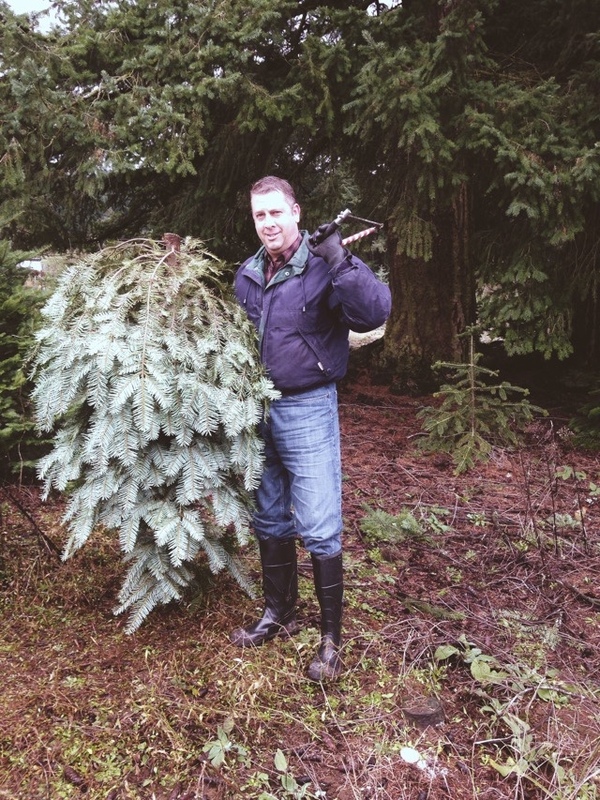 The photo makes the tree look only a few inches taller than me, but our tree is actually 6'4. Lumber Jack Dad here was cooperative with his always-photographing daughter. He only posed like this because I asked him too, but my dad's amazing personality shines through too. I love it! It took only a minute to saw down the tree, the trunk wasn't too thick, which later resulted in our tree falling flat our floor because it didn't fully fit in our tree base. Eeek! My awesome parents rescued it, and my dad put wooden stakes in the base to keep it stable. Besides a couple of Christmas tree mishaps, it has been a good tree. 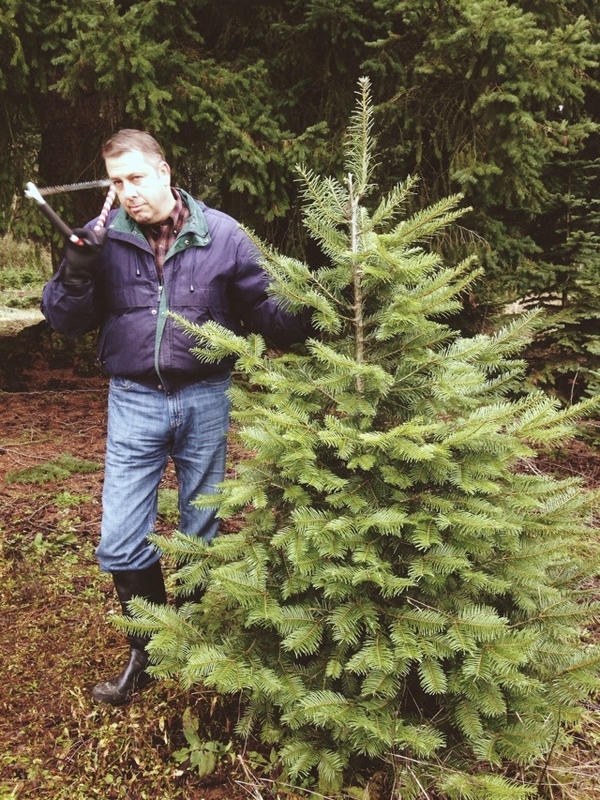 In this photo, it shows that the tree is taller than my dad. My dad is proudly 5'11, and again our tree is 6'4. I thought the tree looked neat turned upside down. Sawed down by Lumber Jack Dad. We decided to decorate it Monday night. 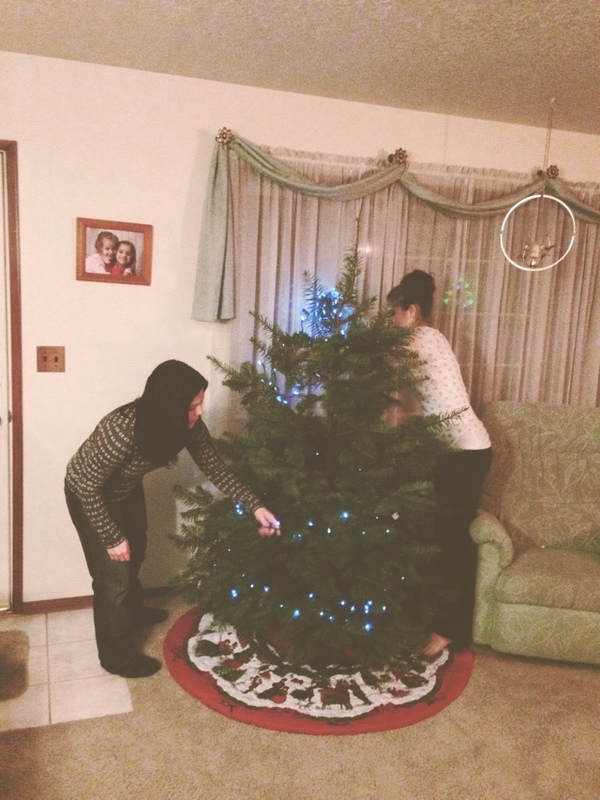 We got our tree last Sunday, December 13, and decided to decorate it December 14. 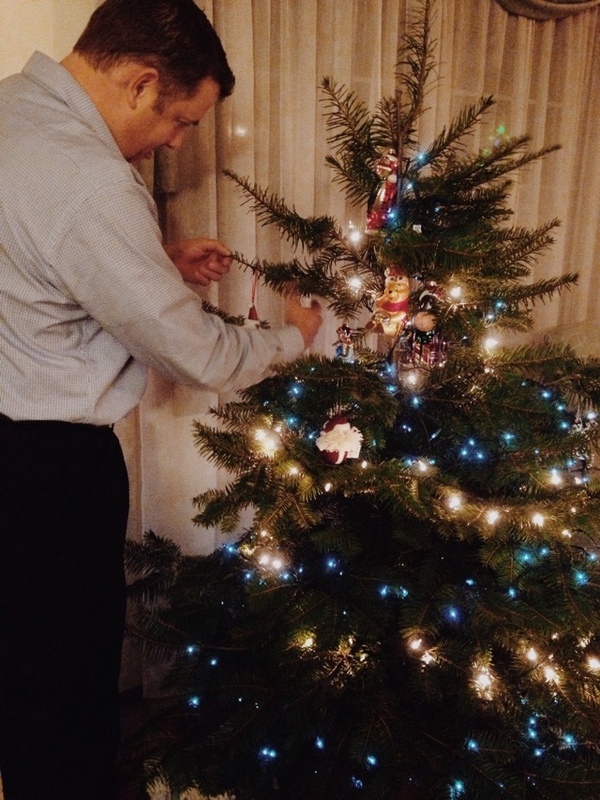 That is when we all had time to be together to decorate our tree. Putting the lights on is of course challenging, but when it is all done, oh goodness, the blue and white lights make it look so pretty. 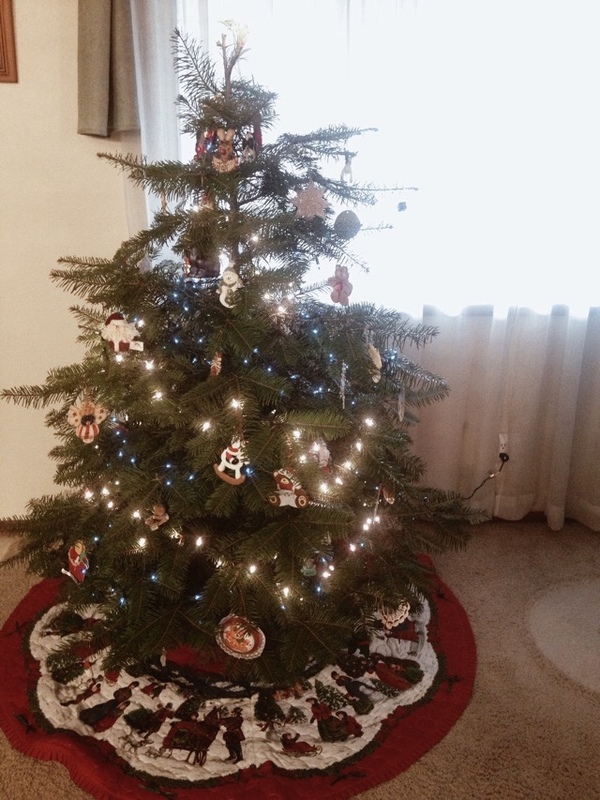 We aren't Christmas tree theme people, we like to put our ornaments on because they evoke memories, and we like to make our tree a part of our family for the few weeks we have it up. Every couple of days, we put up a new Christmas decoration. It keeps the joy of decorating throughout the weeks leading up to Christmas. 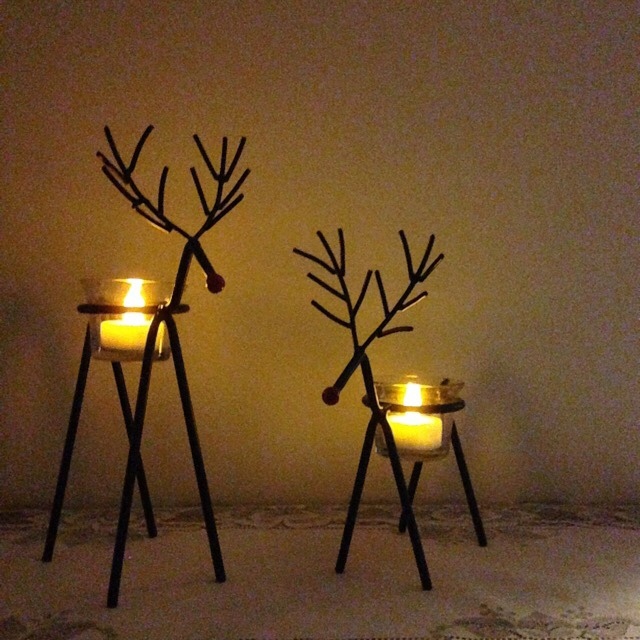 Here a couple of my favorite Christmas decorations this year: These reindeer candle holders. These are the newest Christmas decoration we have, they are so cute. I also love having our Christmas village up. It is so special, and adds some extra light to the house. I love having the village on at night. It is so pretty, and every year that we have it up, since I was little, I have imagined little Christmas villagers running about the village, preparing for Christmas. 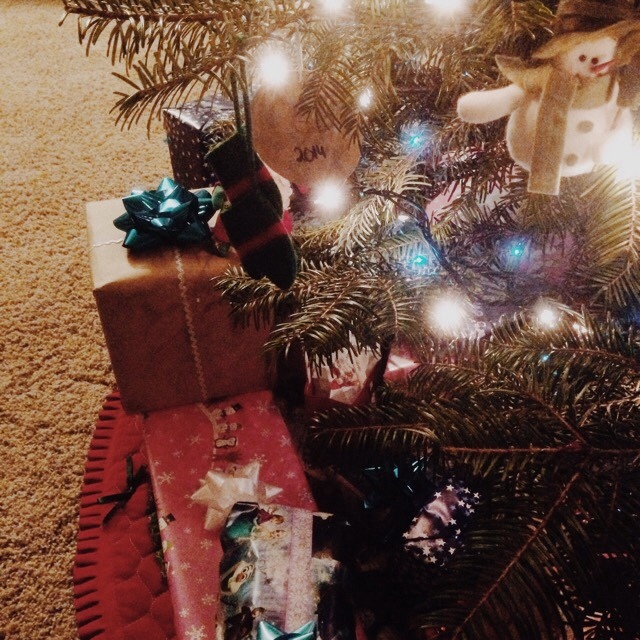 For the past few Christmases, I haven't really cared for the gifts. Gifts are always appreciated, but it has been the times spent with my family that I mostly care about. I love spending time with my family all throughout the year, but there is something about Christmastime that makes it even more magical. I am so excited to see my family for Christmas, and I am excited to give the gifts that I carefully selected and picked out to my family members. To me, giving is far more fun than receiving. Christmas is one of my favorite times of the year, and I am also really enjoying this break from school. I have some plans for this next term, and I am excited to put them into place.